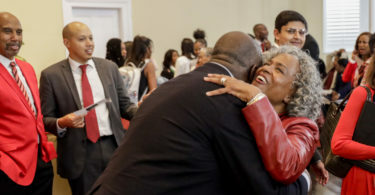 Monica Kaufman Pearson (L) greets Clarke County Sheriff Ira Edwards, Jr.
Monica Kaufman Pearson hugs student Morgan Guthrie after her speech. 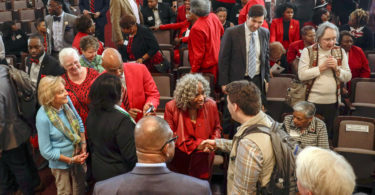 Monica Kaufman Pearson (bottom, center) greets lecture attendees. 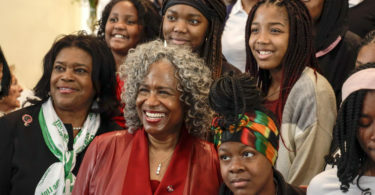 Monica Kaufman Pearson poses for a photo with Clarke County School District students. 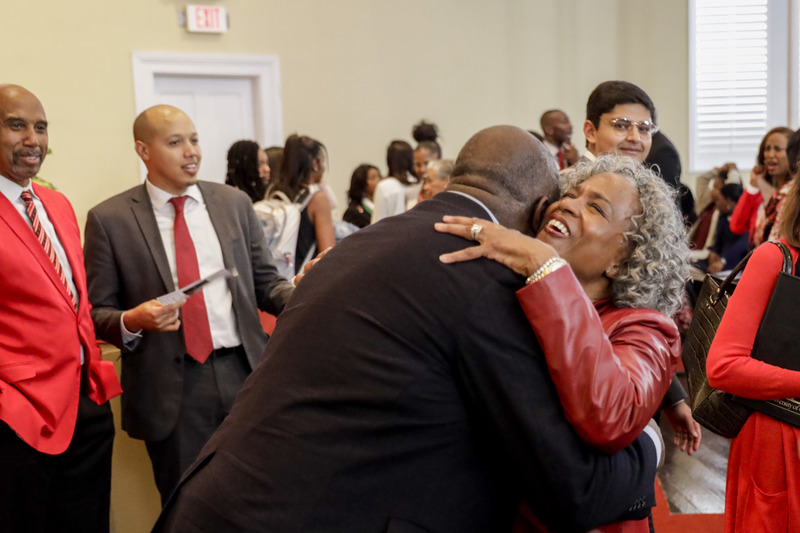 Monica Kaufman Pearson greets a lecture attendee. 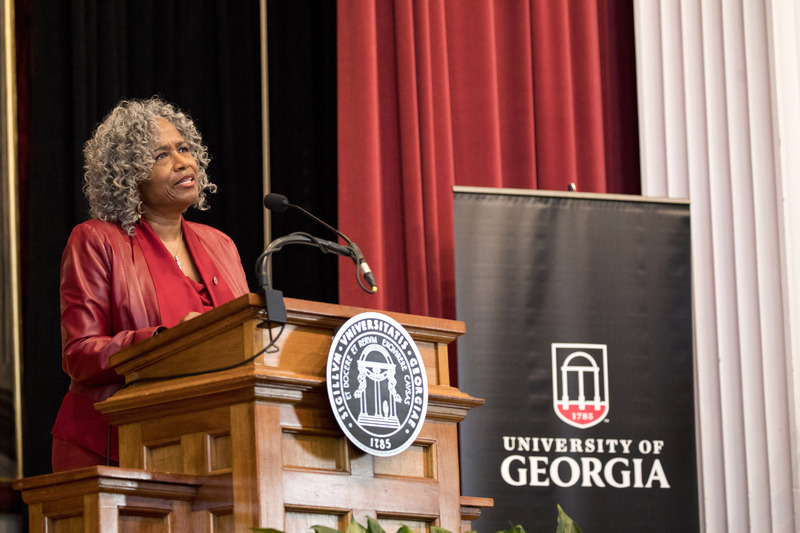 How does the root of racism grow, and what feeds it? 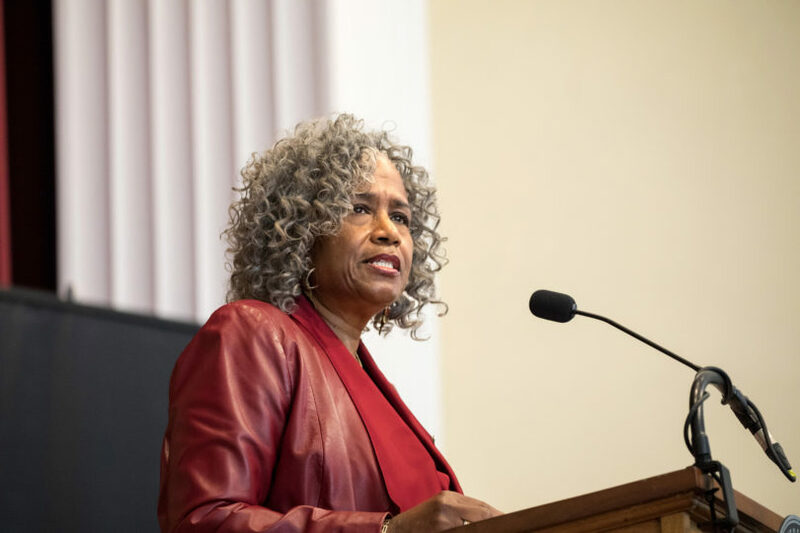 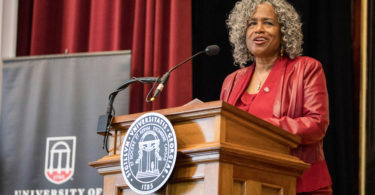 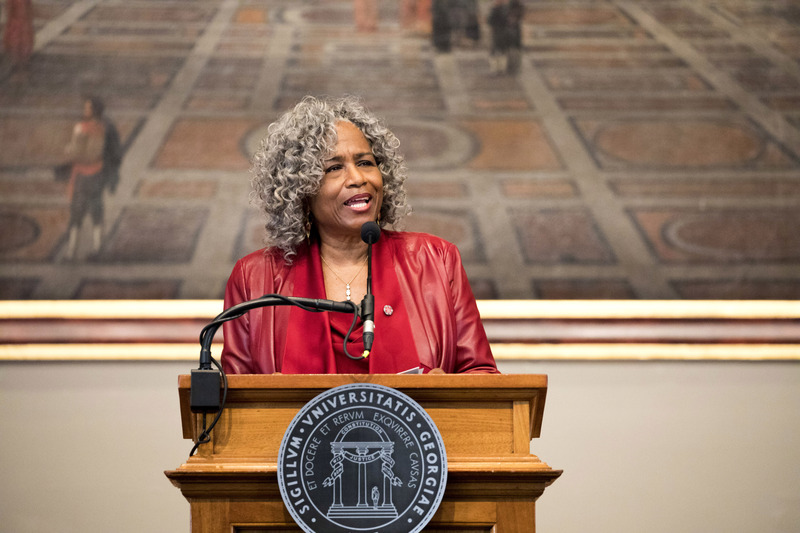 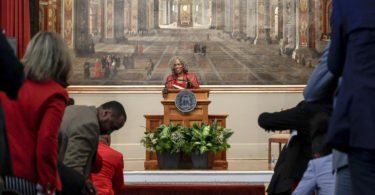 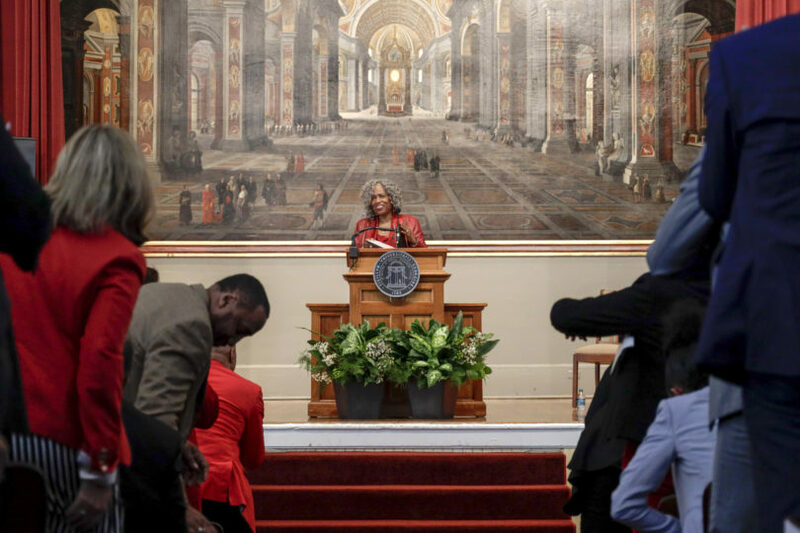 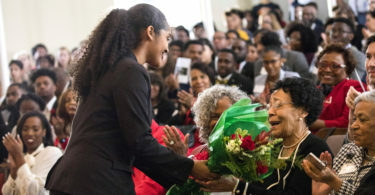 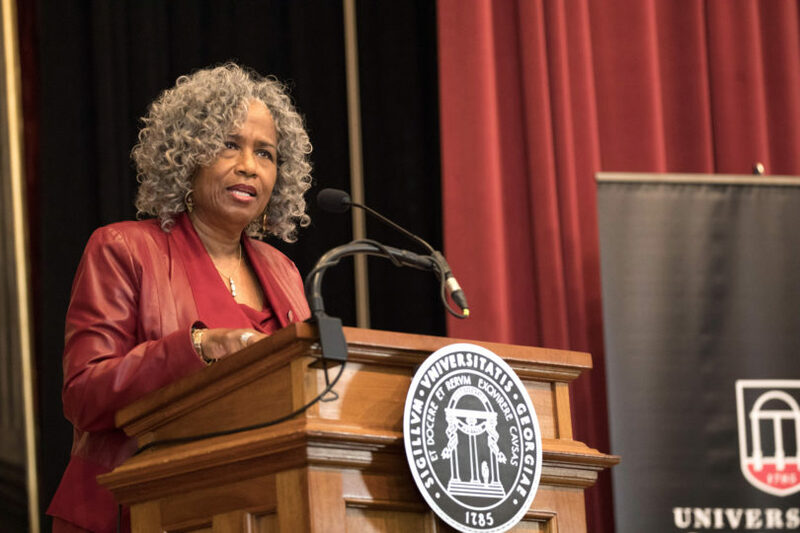 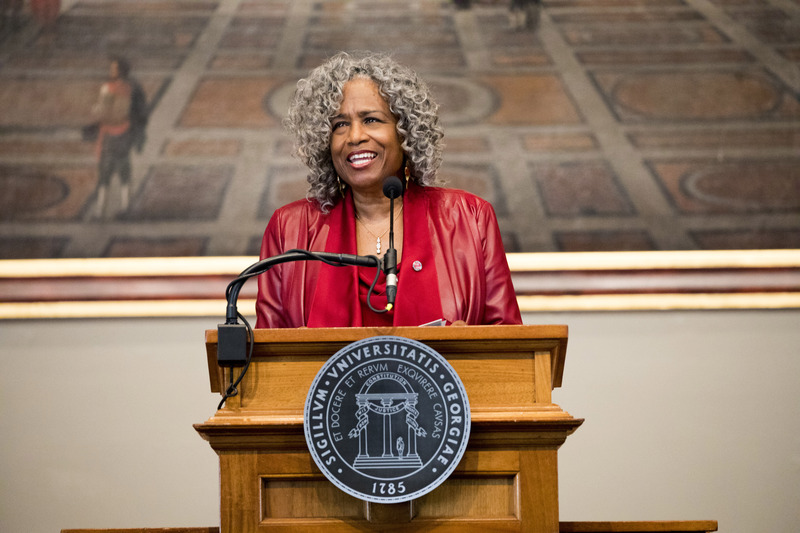 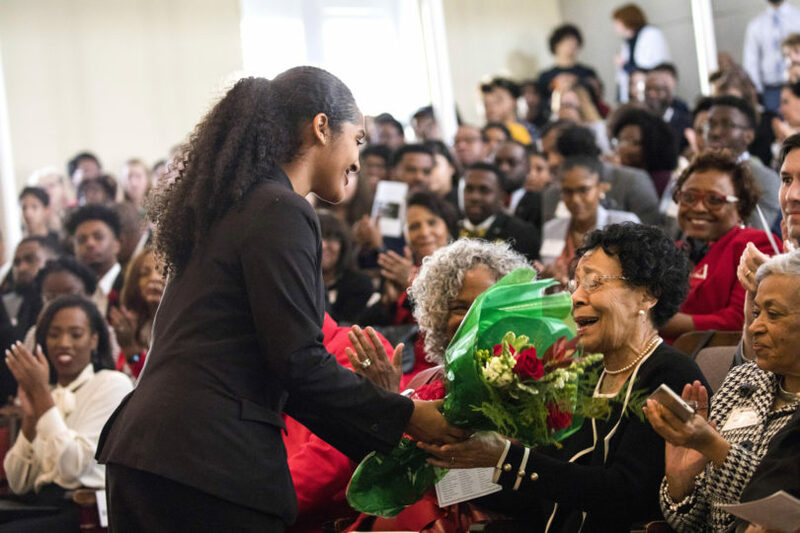 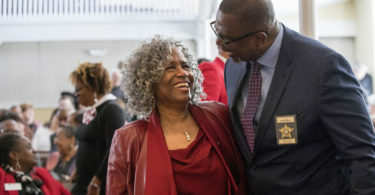 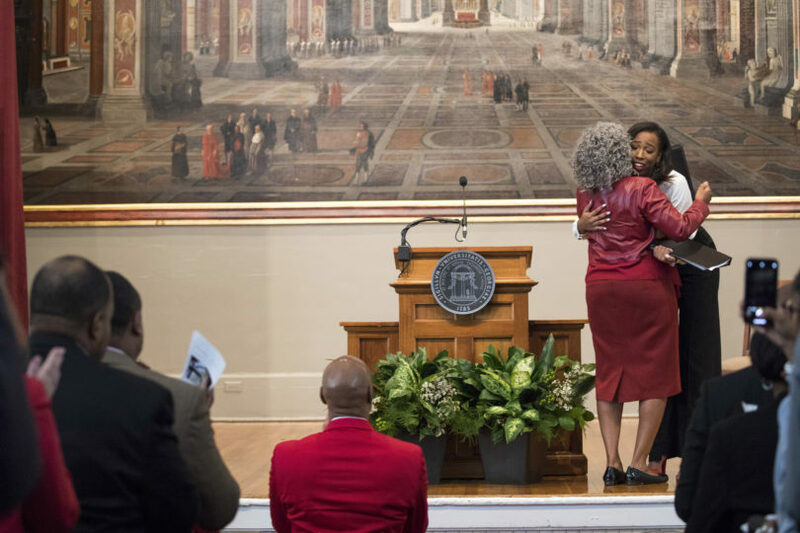 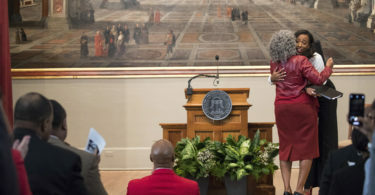 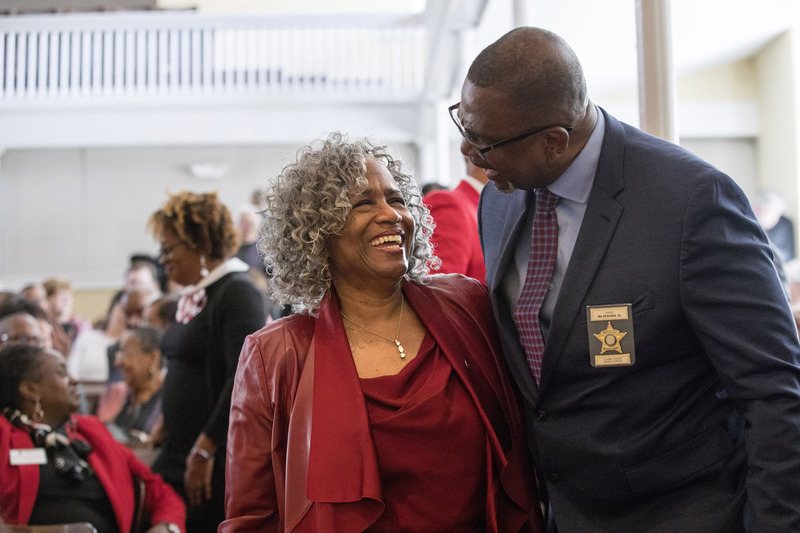 Veteran television journalist and broadcaster Monica Kaufman Pearson, the first African American to anchor an Atlanta-area evening newscast, posed those questions during the 2019 Holmes-Hunter Lecture, held Feb. 7 at the Chapel. 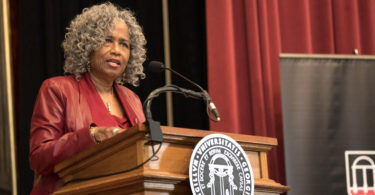 “It’s finally time for us—and you young people are going to be the ones to do it—to get to that root of racism, yank it out of our culture and destroy it,” she said. 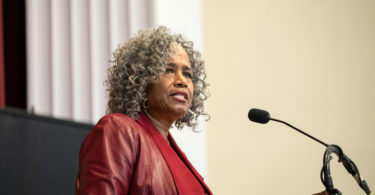 According to Pearson, the roots continue to grow when those messages are passed down from generation to generation, when people don’t admit their biases, when people embrace the stereotypes they see in movies and television and when people aren’t sensitive to the feelings of others. 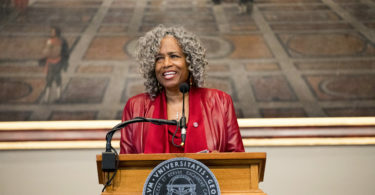 Getting to know each other on a personal level—eating, working, studying and playing together—is a way Pearson suggests to overcome those issues. 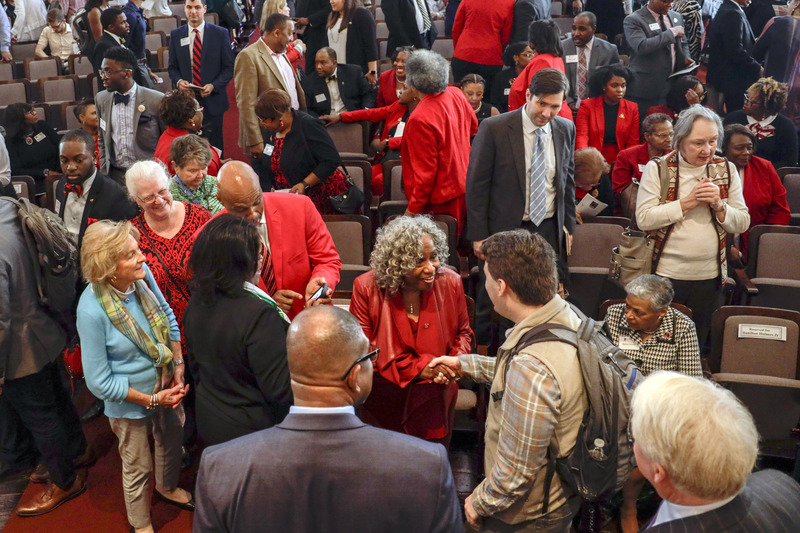 An open and honest dialogue is key to preventing those misunderstandings. 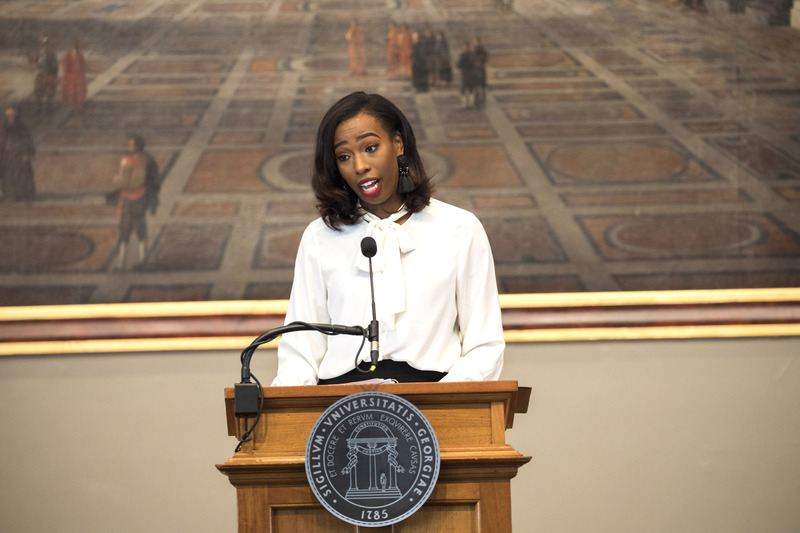 That means explaining why something was hurtful and not allowing stereotypes to filter into conversations. 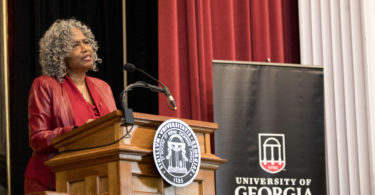 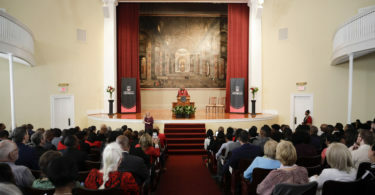 The lecture, named in honor of Charlayne Hunter-Gault and Hamilton Holmes, the first African American students to attend the University of Georgia, also was designated a Signature Lecture. 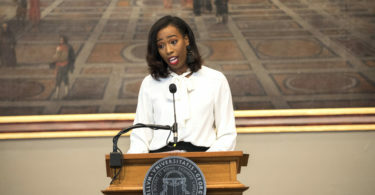 It is sponsored by the Office of the President and focuses on race relations, civil rights and education. 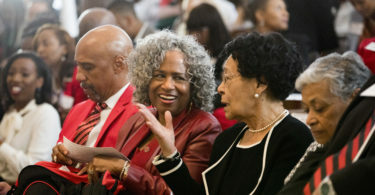 It has been held annually since 1985. 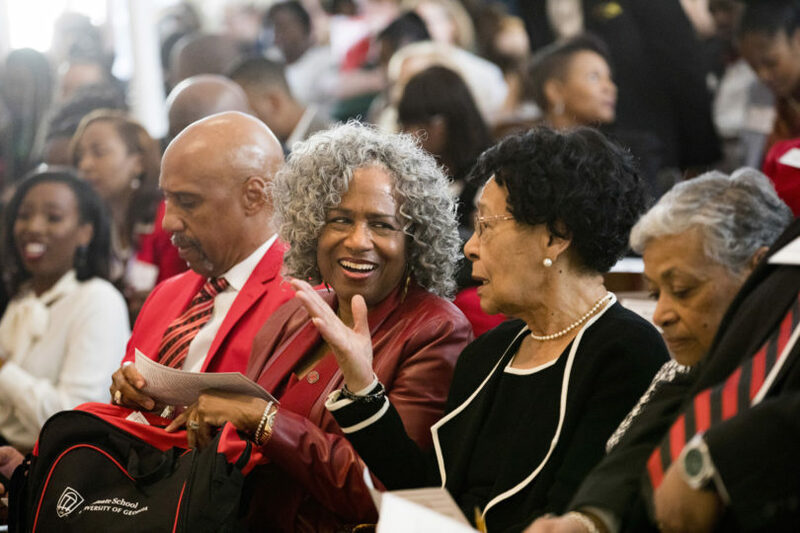 Holmes’ widow, Marilyn, and his children were in attendance, as was Mary Frances Early, the first African American to graduate from UGA. 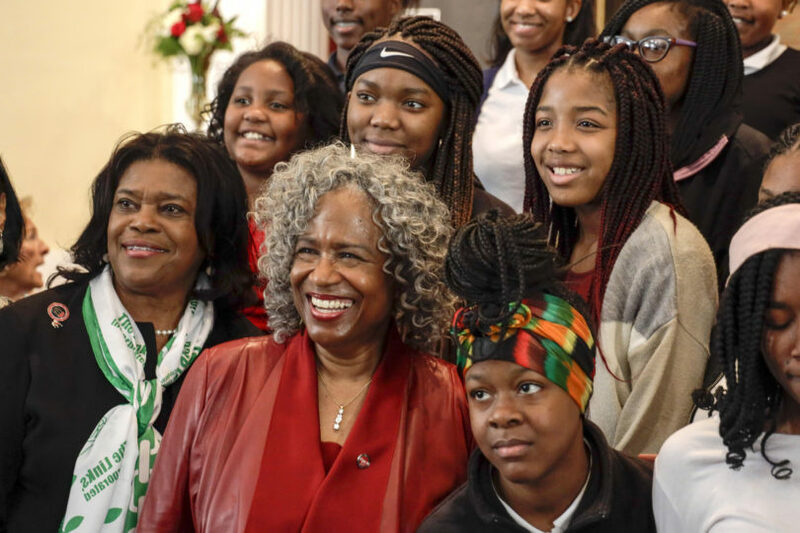 In addition to giving the lecture, Pearson had an opportunity to meet with students from the Clarke County School District and metro Atlanta. 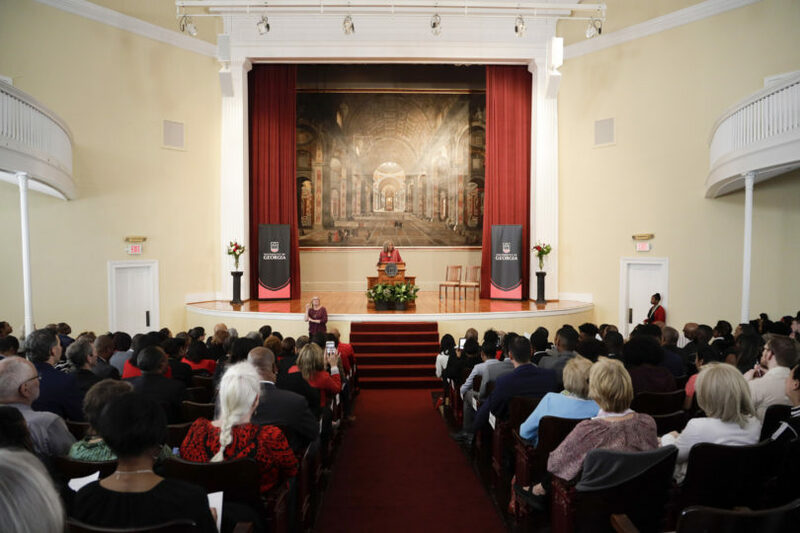 Students gathered at the Grady College of Journalism and Mass Communication to hear from Early, then toured different parts of Grady such as the Virtual Environment Room and Gaming Experience (VERGE) lab and the Grady Newsource studio. 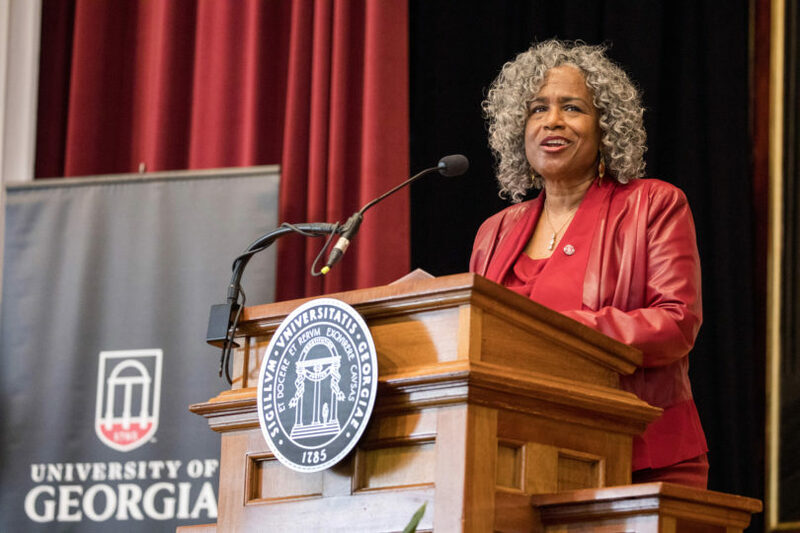 They also heard from TEDxUGA students about how to use their ideas to transform the community before going to the Chapel to meet Pearson and hear her lecture. 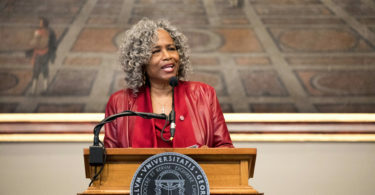 In her address, Pearson noted that people need to truly listen in order to learn from one another.